If, last night, you were up at 11:45 then … well, you were probably like most people. To be honest, I don’t know if The Winning Season, which aired on Cinemax last night, really counts as an insomnia file. Being up at midnight probably doesn’t qualify as insomnia. That said, The Winning Season is an extremely sweet and likable movie that, until I came across it last night, I had previously heard nothing about. Even if it wasn’t directly inspired by insomnia, this was a film that I was happy to discover and I’m going to recommend that, if you haven’t seen it, you discover it too. Of course, I guess I shouldn’t be too shocked that I loved this film because it stars Sam Rockwell. Sam Rockwell is one of my favorite actors. It’s not just that he’s talented and that he frequently takes risks and chooses interesting projects, though all of that is certainly true. There’s a sincerity to Sam Rockwell’s performances. He’s one of those actors who, when you watch him, you feel as if he’s literally opening up his heart and soul to you. There are few actors who can make me cry quite as effectively as Sam Rockwell. That he didn’t win an Oscar for Moon (and has, in fact, never even been nominated) remains one of the most glaring mistakes in the history of the Academy Awards. Sam Rockwell is at the center of The Winning Season and it’s hard to imagine the film working with anyone other than him in the leading role. Sam plays Bill, a former high school basketball star who is now a divorced alcoholic with a 16 year-old daughter that he struggles to communicate with. Like many of Rockwell’s character, Bill is irresponsible but he means well. Bill spends most of his time drinking and working as a busboy at a restaurant. One night, Bill is approached by his former teammate, Terry (Rob Corddry). Terry is now a high school principal and he has an offer for Bill. Terry needs a new coach for the Girls’ Basketball Team. Even though Bill doesn’t consider Girls’ Basketball to be a real sport, he accepts the position. And you can guess what happens. When Bill is first hired, no one takes the team seriously. There’s only six players on the team and none of them — not even the ones played by Emma Roberts and Rooney Mara — believe that they have a chance at a winning season. In fact, their best player breaks her ankle before the season even begins. After a rough start, Bill and the girls bond and soon, they start to win games. Again, it’s not surprising but it is incredibly sweet. And, as predictable as it may be, the film still throws in a few unexpected twists. One thing that I liked is that, even after they started to get good, the team still struggled and lost the occasional game. They didn’t all magically become the best basketball players ever and, for that matter, Sam didn’t magically become the best coach in the world. This is an unapologetic crowd pleaser that still keeps one foot in reality. Everyone, in the film, fully commits to their roles. In particular, Margo Martindale is great in the role of Bill’s assistant. It’s always a pleasure to watch two good actors play off of each other and Martindale’s scenes with Sam Rockwell are fun to watch. But really, the entire film belongs to Sam Rockwell. Sam Rockwell can take the most predictable dialogue imaginable and make it sound like poetry. About halfway through the film, Bill loses his driver’s licence and is reduced to showing up at the games on bicycle. There’s little that is more adorable than Sam Rockwell pedaling across the screen. The Winning Season is an incredibly sweet and likable movie. I’m glad that I discovered it. 1934. Chicago. The FBI guns down a man outside of a movie theater and announces that they have finally killed John Dillinger. What the FBI doesn’t realize it that they didn’t get Dillinger. Instead they killed Dillinger’s look-alike brother. The real John Dillinger (played by Martin Sheen) has escaped. Over the next five years, under an assumed name, Dillinger goes straight, gets married, starts a farm, and lives an upstanding life. Only a few people know his secret and, unfortunately, one of them is Al Capone (F. Murray Abraham). Only recently released from prison and being driven mad by syphilis, Capone demands that Dillinger come out of retirement and pull one last job. Capone has millions of dollars stashed away in a hotel vault and he wants Dillinger to steal it for him. Just to make sure that Dillinger comes through for him, Capone is holding Dillinger’s family hostage. This film, which was produced by Roger Corman, combines two popular but probably untrue rumors, that Dillinger faked his own death and that Al Capone had millions of dollars stashed somewhere in Chicago. Though the two never met in real life (and moved in very different criminal circles), the idea of bringing Dillinger and Capone together sounds like a good one. Unfortunately, the execution leaves a lot to be desired. Sheen and Murray are both miscast in the lead roles, with Sheen especially being too old to be believable as the 40 something Dillinger, and the script never takes advantage of their notoriety. In this movie, Dillinger could just as easily be any retired bank robber while Capone could just as easily be any unstable mob boss. In classic Corman fashion, more thought was given to the title than to the story. One things that does work about the movie is the supporting cast, which is full of familiar faces. Clint Howard, Don Stroud, Bert Remsen, Jeffrey Dean Morgan, Catherine Hicks, Maria Ford, and Martin Sheen’s brother, Joe Estevez, are all present and accounted for. Especially be sure to keep an eye out for Jeffrey Combs, playing an FBI agent who suspects that Dillinger may still be alive. He may not get to do much but he’s still Jeffrey Combs. Since 1971’s THE ABOMINABLE DR. PHIBES was such a big hit, American-International Pictures immediately readied a sequel for their #1 horror star, Vincent Price. 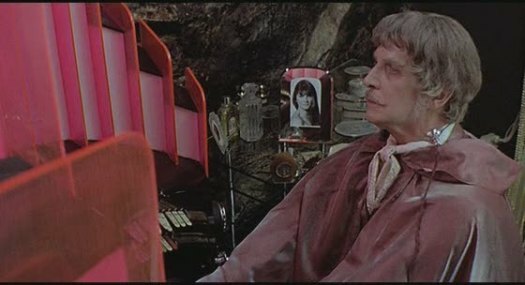 But like most sequels, DR. PHIBES RISES AGAIN isn’t nearly as good as the unique original, despite the highly stylized Art Deco sets and the presence of Robert Quarry, who the studio had begun grooming as Price’s successor beginning with COUNT YORGA, VAMPIRE. The murders (for the most part) just aren’t as monstrous, and too much comedy in director Robert Feust’s script (co-written with Robert Blees) turn things high camp rather than scary. As we all know, music video of the day has always been and always will be Val’s baby. Starting with If You Don’t Know Me By Now in June of 2016, Val has shared and analyzed over 300 music videos! It’s become one of my favorite of our regular features here on the Shattered Lens. As most of you know, for health reasons, Val is taking a temporary break from this feature. Until Val comes back, I figured that I might occasionally share a video or two. Admittedly, I do not have Val’s encyclopedic knowledge of music (and I should admit that my musical taste pretty much begins and ends with EDM) but what Val and I do share is a deep appreciation for a little Canadian show called Degrassi. See, it was that love of Degrassi that led me to the video below. Earlier tonight, I was rewatching Death of a Disco Dancer, the third episode of Degrassi’s fifth season. In this episode, Paige is upset that her friend, co-worker, and classmate, Alex, doesn’t seem to care about going to college. When Degrassi hosts a college fair, Paige attempts to entice Alex to attend by offering her a joint. “Will you go if you’re high?” Paige asks. “I’ll go if you’re high,” Alex answers. The two of them duck into an alley and light up the joint. What follows is perhaps the best three minute montage in the history of Degrassi as a very stoned Paige and Alex walk through the fair, giggling at all the Canadian college recruiters. It’s all good fun until Paige discovers that a friend of her mother’s is at the fair. Uh-oh! Anyway, I’ve always loved the song that plays during the montage. It’s called Upfront With You and it’s performed by a Canadian band called Universal Honey. After watching the episode tonight, I looked the song up on YouTube and that’s when I came across the video that was made for it in 1996. Now, despite doing a handful of Google searches, I can’t tell you who directed or worked on this video. I can tell you that Universal Honey has been around since 1992 and the band is made up of Leslie Stanwyck and Johnny Sinclair. (Before Universal Honey, they were both in a band called The Pursuit of Happiness.) Up Front With You is off of their first album, Magic Basement. Not surprisingly, this is a Canadian band. One of the great things about Degrassi is that it exposed me to a lot of Canadian bands that I, as an American, might otherwise have never heard of.